T-R PHOTO BY STEPHEN KOENIGSEFLD • AGWSR’s Caleb Meinders launches the shot put during one of his final’s throws Thursday at the Class 1A state track and field meet. Meinders won the state title in the shot put at 55 feet, 3 inches. It’s the first state title in the shot put for either Ackley-Geneva or Wellsburg-Steamboat Rock since 1967. DES MOINES — Spooky. Freaky. But cool. 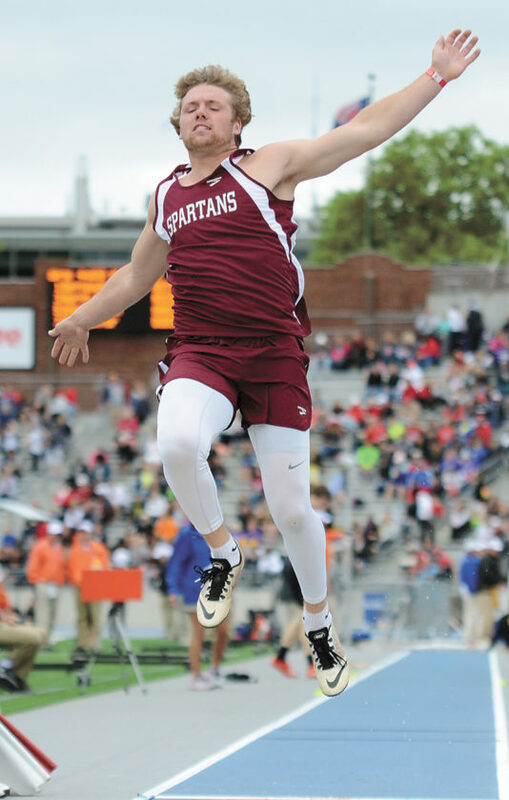 That’s how Caleb Meinders described his Class 1A state title in the shot put Thursday morning. No, he was actually a little more at a loss for words and couldn’t stop smiling after finally achieving a performance that had been eluding him for years. Too many times, during the football and wrestling and past track and field season, on the grand stage, others were able to out-mark the AGWSR senior. But when diving in a little deep to the details of Meinders’ accomplishment, it was a “a little spooky” at what he had done. Fifty years to the very day, Darrell “Butch” Jansonius threw the last state-winning shot put throw for Ackley-Geneva. Gas was 33 cents a gallon, movie tickets went for $1.25 and average cost of a new house was $14,250. The year was 1967. Meinders snagged top honors for the Cougars with a throw of 55 feet, 3 inches, while Dawson Ellingson from Hudson (NICL East) threw 54-8 1/2 for second. Meinders’ teammate, Nathan Karsjens, shocked the field with a throw of 54-4 in his second-to-last attempt. He was seeded 10th and not projected to make the finals. Karsjens had the fourth-best throw in Class 1A coming into the state meet at 50-8. But the competition in the air made everyone a little hungrier for any extra foot they could get. To make that “icing on the cake” a little sweeter for Meinders, it happened to be a nice birthday present for his father, who was on hand and put the state title medal around his son’s neck. Caleb picked up his dad in bear-hug fashion as the two posed for pictures after the final throws. Meinders and Karsjens both still have the discus to throw this afternoon at 11:30 a.m. Karsjens is seeded second with district throw of 167-11, while Meinders is No. 17 at 133-8. The pair of throwers will hope to continue a fight in the team race as well. The AGWSR 4×800-meter relay team of Alec Stahl, Tate Hofmeister, Austin Rekward and Liam Stubbe took fourth in 8 minutes, 12.81 seconds, to grab five more team points. Brent Janssen doubled in the 200 and 100, finishing 21st (23.95) and 19th (11.64) respectively. After five events scored, the Cougars were second place in the team race with 21 points, just behind Lisbon with 22. 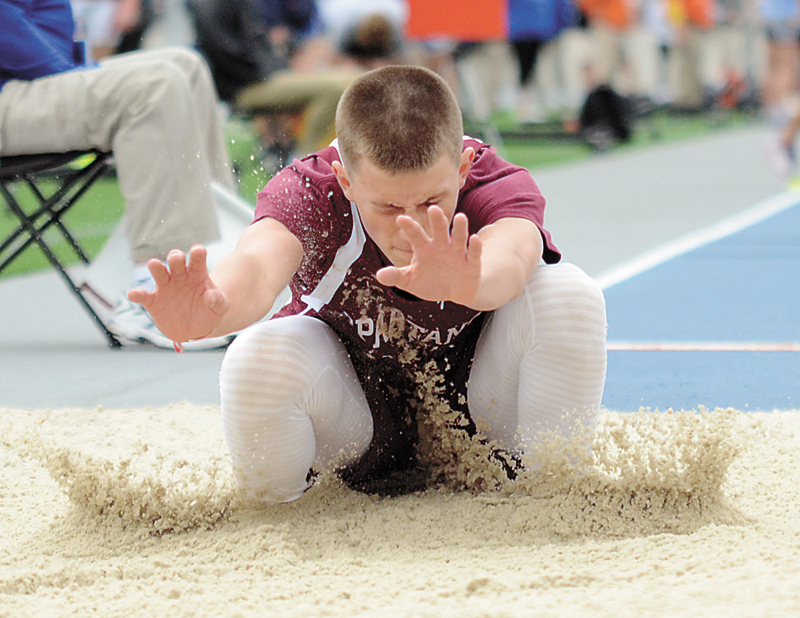 Grundy Center’s Will Grames shocked himself and the long jump field Thursday, as he took eighth place and medaled in his first state appearance. The freshman jumper went for 19-7 1/4 after being seeded 19th overall. He was accompanied by senior teammate Bryce Flater, who took fifth with a jump of 19-11 1/4 in his final state meet appearance. Afterward, the pair poke and prodded at each other, enjoying the spoils of their state medal. Grames found it hard to necessarily find the words to describe the moment. Grames gave credit to having his senior teammate on his side, though. 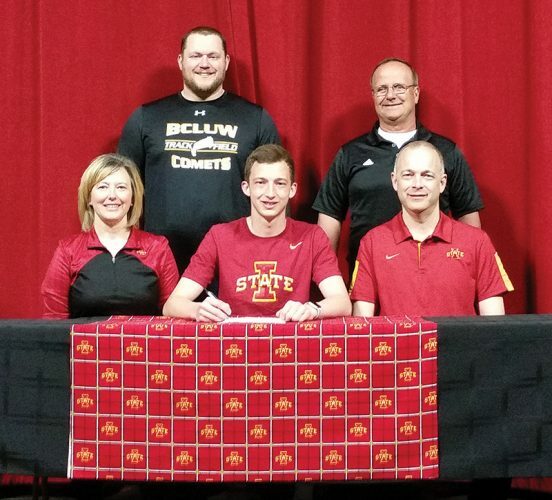 Flater added he did his best to pump up one of only two freshmen in the field of state jumpers. Grames said Flater was the voice on his shoulder he needed to get through to finals. 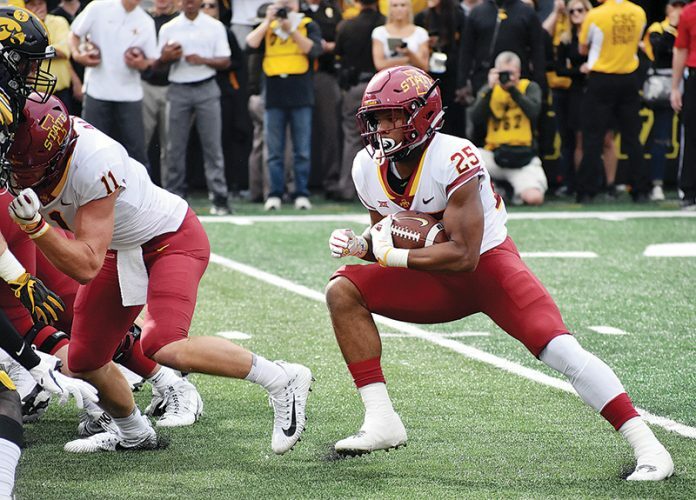 Caleb Cobbs said his 3,200 was a bittersweet race. The Colo-NESCO distance runner clocked a 10:00.27 to place ninth, just a spot away from medaling. He said despite running a 10-flat two-mile, he wasn’t able to find the podium. He said that just goes to show how deep the event was this season. Colo-NESCO’s Wayne Beard was also on hand Thursday, running an 11.64 in the 100 preliminaries. He did not qualify for the finals Saturday, placing 11th. Gladbrook-Reinbeck had a relay and a solo event Thursday. The 4×800 team of Matt Johannsen, Hunter Lott, Colton Clark and Parker Bown took 19th in a time of 8:38.69. Erik Knaack also jumped 18-10 3/4 in the long jump, good enough for 13th place. Action resumes today beginning at 9 a.m. with field events and the girls 1A and 4A distance medley finals. T-R PHOTO BY STEPHEN KOENIGSEFLD • East Marshall’s Nick Meling makes the turn toward the homestretch in the Class 2A 3,200-meter run on Thursday. Meling set a personal best of 9 minutes, 43.89 seconds, and took seventh. T-R PHOTO BY STEPHEN KOENIGSEFLD • Grundy Center’s Kyah Luhring takes a leap during the finals session of the long jump at Thursday’s Class 1A state track and field meet in Des Moines. Luhring was third with a jump of 16 feet, 2 3/4 inches. T-R PHOTO BY STEPHEN KOENIGSEFLD • Meskwaki Settlement senior Grace Tahahwah, left, leans for the finish line in front of Debi Hiserote from Siouxland Community Christian during their heat of the Class 1A 100-meter dash on Thursday at Drake Stadium in Des Moines. Tahahwah qualified for Saturday’s finals as the eighth seed. T-R PHOTO BY STEPHEN KOENIGSEFLD • Marshalltown’s Malory Henze warms up in the discus ring on Thursday, prior to the event at the Class 4A state track and field meet at Drake Stadium in Des Moines. Henze was 10th with a final throw of 116 feet, 4 inches. T-R PHOTO BY STEPHEN KOENIGSEFLD • South Tama County’s Stacey Slaven clears the high jump bar set at 5 feet, 2 inches, on Thursday during the Class 3A state track and field meet. Slaven took fourth place, clearing 5-4. 1A — 1. Lisbon 22, 2. AGWSR 21, 3. Pekin 17, 4. Hudson 16, 5. Central Lyon, Lone Tree, Sigourney 10, 8. North Union, West Sioux 8, 10. Earlham 8; 13. Grundy Center 5.